Mr and Mrs Shahi have owned the Best One Off-Licence and Newsagent’s in Nottingham Road, Borrowash since 2004. During that time, the popular couple and their family have worked extremely hard to make Best One a modern and competitive local business. “Mr and Mrs Shahi are exactly the type of local traders who give village life a good name. When the Shahis bought the store, it was in a sad state of repair and frankly, filthy. Mrs Shahi had to fumigate the upstairs living quarters and the shop had become a magnet for anti-social disorder, with a very bad local reputation. “Local gangs of youths, intent upon causing trouble would hang around outside, drinking from beer cans and littering the shop front with debris. We installed CCTV but the problem was intensified because Erewash Borough Council refused point blank to install a refuse bin. We bought a bin ourselves which we had to empty each night but because local offenders knew that this was the case, they began filling the bin with half –full beer cans, general refuse and even dog excrement. We could no longer continue with the bin — so we had to remove it. And then we started to find polythene bags filled with dog mess left outside our store. It was very upsetting and absolutely disgusting. We were at our wits end”. 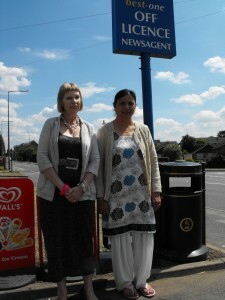 Mr and Mrs Shahi found that approaches to local Parish Councillors did not result in action from Erewash Borough Council and so contacted Helen Clark from the local Labour Party.A double purpose dog and refuse bin was installed within a month by Erewash Council Environmental Services Department. “During the recent Borough Council elections and the Sawley by-election, environmental standards were really high on people’s list of priorities. ‘Well being’ was and remains – one of the key pledges for Labour and the sorry saga of this bin – with its happy resolution – is an excellent example of how important these matters are. People who live in the Shacklecross area of Borrowash really need this convenience store. What they don’t want is for the Shahi family to decide that they have had enough and to move on! I am delighted that Erewash Borough Council has responded to my request on behalf of these excellent local traders – but the problem should not have taken a whole seven years to resolve! It is time that the Conservative administration at Erewash stopped playing lip service to well being and environmental standards and took some action. Promoted by P J Ball of 20 Station Road Borrowash Derby DE72 3LG. Hosted by e-webdevs.com No public money is used in the hosting of this site.